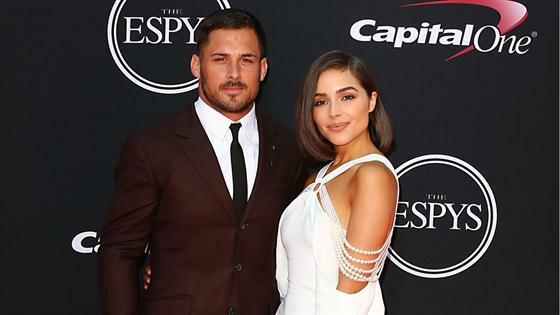 Are Olivia Culpo and Danny Amendola officially back together? The 26-year-old former Miss Universe and her 33-year-old NFL star ex sparked reconciliation rumors this week when they seemingly celebrated New Year's Eve together. The duo posted similar footage to social media of a firework celebration in Miami, causing their fans to speculate about their relationship status. Now a source tells E! News that Culpo and Amendola have "reconnected" and are "working on their relationship." "They spent several days together in Miami for New Year's Eve and realized they really care about one another," the insider shares. "They are definitely trying to work out their relationship and both want to get back together." "Olivia has been more hesitant and is taking each day as it comes," the source continues. "She doesn't fully trust Danny anymore, but has a soft spot for him. Olivia really loves him and wants it to work out." Culpo broke up with Amendola back in October after photos surfaced of the Miami Dolphins wide receiver on the beach with reporter Bianca Peters. "She is seeing how things go, but definitely wants Danny to prove himself to her," the source adds. The duo first split in March 2018 after two years of dating, but reconciled months later. "Olivia and Danny are exclusively back together and are in a great place since splitting," a source told E! News over the summer. "They really needed space and to figure things out, but their paths led them to reconnect again and they're really happy."